Great location for those who want to have easy access to Rotorua attractions but prefer a semi-rural location-Situated on the slopes of Mt Ngongotaha. 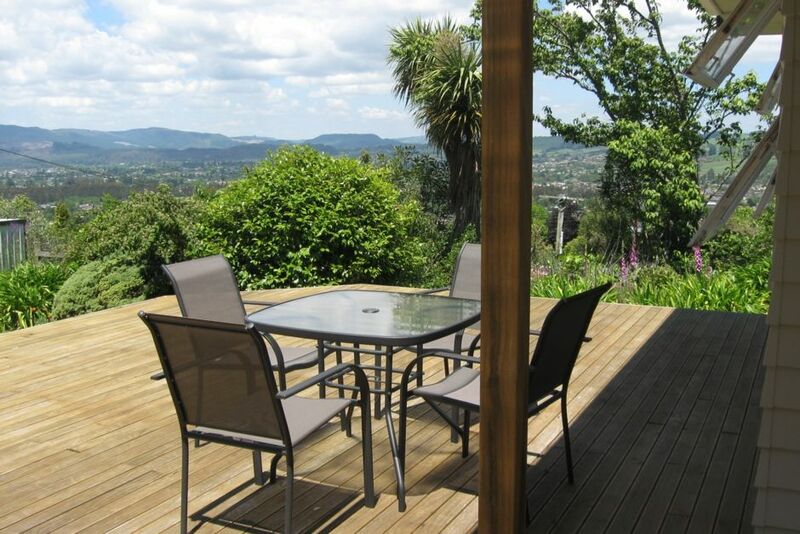 From the large deck the views are across the city to the Whaka Forest (home of well-known mountain bike tracks) and takes in surrounding landscapes - including Mount Tarawera. The property is set in approximately three quarters of an acre which is being gradually developed into gardens. A very peaceful setting with bush clad Mount Ngongotaha as a backdrop. Children stay FREE. This applies to pre-school and school aged children belonging to the family staying. Only applies to families living in New Zealand. Children from families living outside New Zealand pay NZ$10.00 per night. Currently the booking system cannot show this discount when making a booking enquiry - you need to ask for this discount when making your enquiry which will then allow us to change your quote to reflect the child discount. The Cottage is a 1960s original with comfortable furnishings. In addition to the Cottage there is a double garage with an attached sleep out. This is has a double bed and armchairs and is perfect for additional guests or as a place to escape to unwind and read. For those who prefer activity - in the garage there is a table tennis table ready to use. A portable cot is available for use if required. The Cottage sits on the east side of Mt Ngongotaha. During the winter months the mountain casts its shadow over the Cottage by mid-afternoon. Nevertheless the Cottage remains warm and cosy with electric heating and a pellet fire. During summer months the Cottage enjoys all day sun. Linen (sheets, pillowcases and towels) is NOT included in basic rental price. Guests are encouraged to bring their own. However these can be provided by the owner for NZ$8.00 per person per stay. All other bedding IS provided as part of the basic rental. Roger and Rosemary purchased this property to develop it into a private park and garden. The location and the view (on the side of Mount Ngongotaha) is what attracted us. While it is a big project - we enjoy spending hours working in the garden. Rotorua is a beautiful place to live and visit. Rosemary grew up in Rotorua - and as a couple we have lived here for 34 years. No desire to live anywhere else. We live just 10 minutes away from the Cottage - so are in easy contact if needed. This is a perfect location for those who want to be out of the normal tourist areas of Rotorua - but only 10 minutes away from the centre of the city. All of the tourist attractions are in easy distance from the Cottage. It is a genuine 1960s Cottage - but warm and comfortable without being flash. A very peaceful setting surrounded by gardens. Altogether there is 2 1/2 acres being developed into a park-like setting. Over the past two years over 1,400 trees and native plants have been planted on the property. Newly developed paths lead up the side of Mt Ngongotaha through the new planting. Fairly steep but with amazing views over the whole Rotorua basin. A large deck to relax on and enjoy the view. Very comfortable cottage with ample everything. Lovely views over Rotorua and the steam-filled valleys in the mornings. Garage space perfect for our mountain bikes over the weekend - easy to get to and minutes from centre of town. Great views, spacious and well-kept property, plenty for the kids to do. Highly recommend it! Roger is a great host and we found welcome gifts of flowers and blueberries straight from their beautiful garden waiting for us on arrival! Comfy beds and plenty of space for little ones (who loved playing on the swings and trampoline in the garden). Fantastic view from the house and garden, nice and peaceful location while only being 5min drive out of town. Thoroughly recommended! We really really liked this place. Such a sweet little cottage with amazing views, and incredible garden and everything we needed in the house. The kids loved the tramp, toys, swings, basketball hoop and table tennis! We hope to come back on our next trip to Rotorua! Lots of amenities to keep the kids happy, beautiful gardens. Just far out of the hustle and bustle of Rotorua, but only 10 minute drive to most attractions. We had a great stay - the cottage was cosy and comfortable. The garden was amazing and so were the views. It was brilliant being able to see the steam rising from the geothermal areas / see the lake and the mountains and sunrises over town. There were heaps of things to do at the house although we spent a lot of time out and about. Our host was lovely and everything went very smoothly. Highly recommended!